Thanks to many years of dedicated research, Ecomega’s experts have engineered a new set of L5 MAX tyres for numerous types of skid steer loaders and their operational needs. Ecomega L5 MAX tyres are the perfect solution for your construction vehicles if you are looking for a highly reliable and efficient set of tyres. Ecomega L5 MAX tyre guarantee exceptional performance and maximum durability, even while operating on the most challenging types of surfaces. Ecomega has been one of the leaders on the international construction tyre market for many years, thanks to its highest expertise and use of the most advanced technologies. Choosing Ecomega L5 MAX tyres means opting for the best quality and efficiency available, anytime and anywhere. 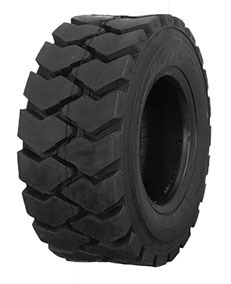 Ecomega tyres for skid steer loaders feature an enhanced and longer tread life. Thanks to the recently improved tread design, these specialized tyres are highly durable, even if working in the most difficult conditions. The excellent wear life is paired with an improved traction and adhesion, even on the most difficult terrains. One of the main features of Ecomega tyres for skid steer loaders is their improved productivity in the long term. Robust crown and reinforced sidewalls guarantee maximum stability at any time. Improved tread blocks also guarantee maximum resistance to all sorts of accidental damages, including cuts and ruptures. Ecomega tyres for skid steer loaders are highly resistant to all sorts of impacts, and as such are a safe choice at any time. Their highest reliability translates into lower maintenance and repair costs. Maximum performance is guaranteed at any time, anywhere. Another great feature of Ecomega tyres for skid loaders is their outstanding stability. No matter where you operate, these specialized tyres guarantee maximum comfort, for smoother and more pleasant rides. Ecomega tyres for skid steer loaders is a long-lasting guarantee of highest quality, enhanced reliability and safety at any time. Your loading and unloading operations have never been so smooth, thanks to these specialized tyres.